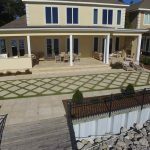 Gordon - Executive Landscaping, Inc.
Executive experience helps us find ways to work around problems while creating beauty. No matter how much you like your neighbors, 20 feet between houses is too close for comfort! Slapping up a privacy fence would seem like a slap in the face to the neighbors. So what do you do? Well, the Gordons called for a little Executive Planning to turn their challenge into a triumph. The Gordon property needed landscaping that would be attractive yet easy to maintain and wanted to update the tile on their porch area. 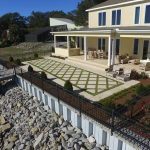 In order to create a more useable entertaining space in their backyard, they also wanted to install an outdoor kitchen and a comfortable seating area with a fireplace and television. Executive designers used our creative ability by using our client's wish list to solve problems. Executive used 3-D imaging to provide our clients a preview of the finished product before we even started! 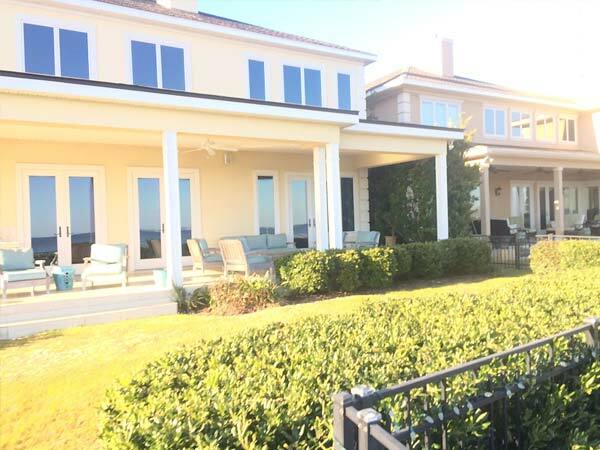 Due to the proximity of the neighbor’s house being less than 20 feet away and having no true visual divide, privacy was a top concern for the clients. 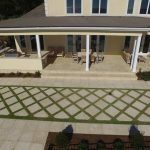 The existing landscaping had also been allowed to deteriorate and had been overtaken by unsightly weeds, and the existing tiling on the floor of the porch was beginning to feel worn and outdated. Function met form when we used the fireplace to double as a privacy wall while checking off every item on the wish list to create an Executive Masterpiece! The design team at Executive Landscaping, Inc., met with the Gordons to determine an effective plan for accomplishing each of their goals. Knowing that the client wanted a minimal amount of actual grass in the backyard, we overlaid the existing areas of tile on the porch with peacock pavers that would, in effect, provide a visual tie-in to a newly created “terrace area” being constructed of peacock pavers laid in a grid-like pattern with six-inch strips of turf running between them. 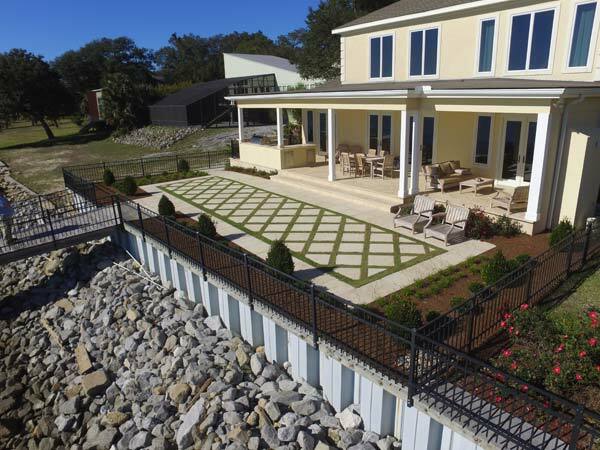 To provide better access from one area to the next, we added concrete steps along the entire backside of the tiled porch, leading to the terrace. 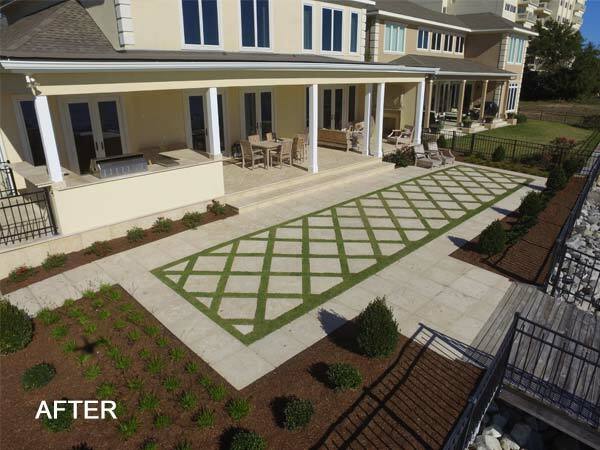 The subsequent need for turf maintenance was minimized through the use of geo-zoysia, which has a slower growth rate; and a soaker type irrigation system was installed under the turf to eliminate the need for overhead water. 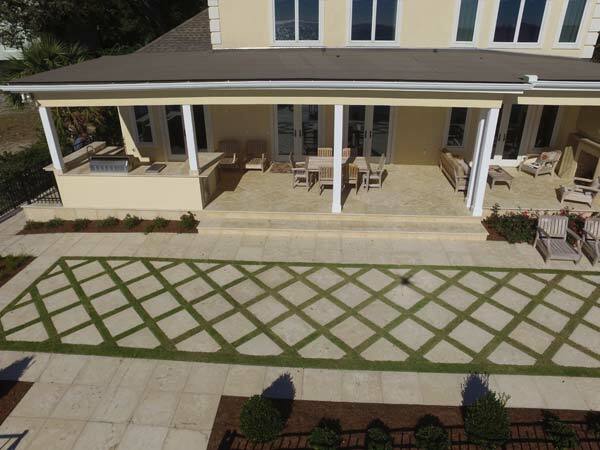 A large new U-shaped outdoor kitchen was constructed and fully equipped with a grill, smoker, and a sink as well as various other appliances that would accommodate the Gordons’ needs. Seating areas were constructed along each end of the bar to provide additional functionality. To create a greater sense of privacy from the neighbors, a fireplace was constructed on the east side of the Gordons’ property. In effect, it served both as a privacy wall and as an area for the big screen TV to be mounted, offering dual-purpose design that addressed two of the clients’ wishes. 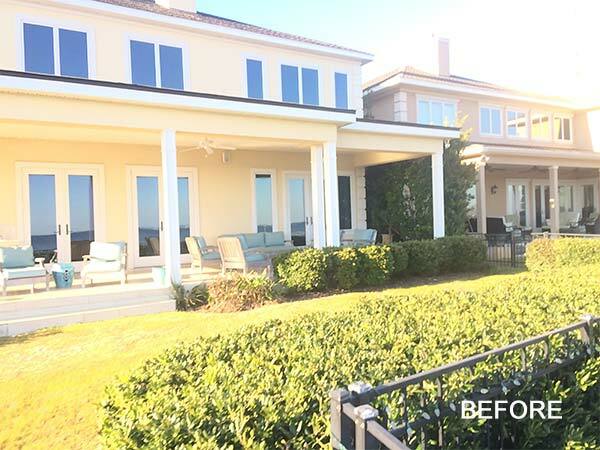 We created a beautiful, more useable and low-maintenance landscape in the backyard to provide the client with an outdoor space that would accommodate their love for outdoor entertaining and offer them much-needed privacy. We reduced the amount of turf by increasing maintenance-free hardscaping and adding to their existing patio areas. 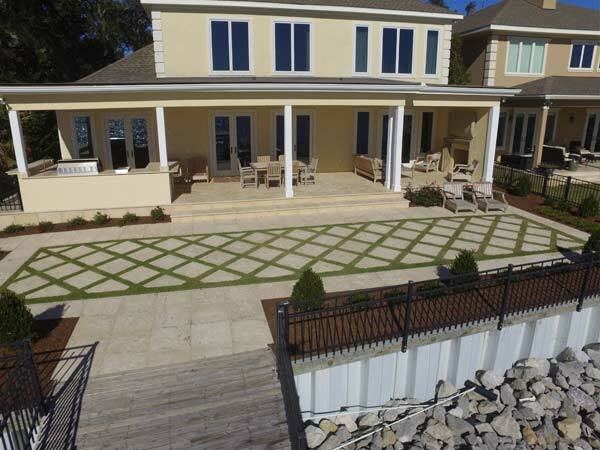 We also selected resistant grass for those areas in which we did maintain turf. To provide the Gordons with more opportunities to enjoy the use of their backyard, we designed and constructed a new outdoor kitchen, dining areas and entertainment space complete with comfortable seating and a fireplace. 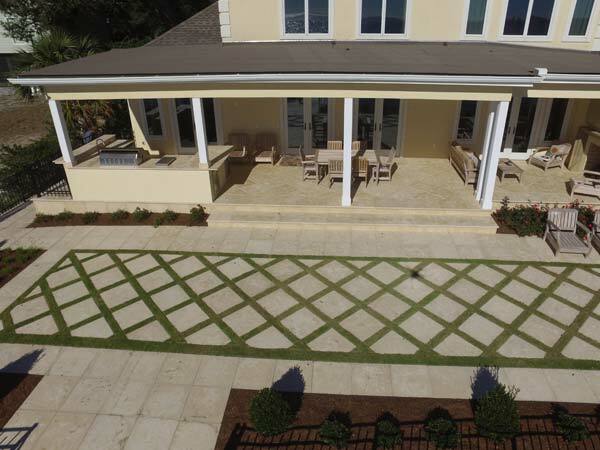 Make your backyard dreams a reality as an Executive Masterpiece! 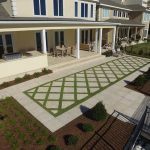 Call the team of outdoor design experts at Executive Landscaping, Inc., for a customized estimate on your very own Executive Masterpiece today!